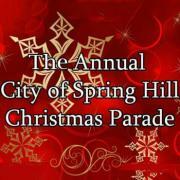 You won't want to miss the 9th Annual City of Spring Hill Christmas Parade, sponsored by Spring Hill Kiwanis. -Parade - Dec. 5 at 5 p.m.
-Main Street will be closed at 4:30 p.m.
-All related side streets from The Crossings area to Duplex Road will be closed at 4:50 p.m.
-Sudden temporary road closures may occur due to pedestrian traffic. -Those traveling northbound on U.S. 31 wishing to avoid the Main Street closure should re-route via 396/Saturn Parkway. -All northbound traffic after the SR396 off-ramp will be turned into The Crossings. -At 4:30 p.m., Northbound U.S. 31 at Rippavilla will be one-lane travel. -Parking: In anticipation of road closures and traffic relating to the parade, you will want to arrive early to park. Parking will be available near the parade route at Spring Hill Elementary and Evans Park.